The Pata Forest Reserve was once part of a vast, unbroken Sudanian woodland that stretched from the Gambia River to the Casamance River, with narrow gallery forests following the watercourses. At least 20 species of woody plants are common throughout, with many more species of Guinean zone affinity found in the gallery forests (Stancioff and others, 1986). These woodlands are by nature very heterogeneous in floristic composition which also makes them remarkably uniform in structure (Pélissier, 1966). Besides their value as a woodland ecosystem, they also serve as extensive grazing land for cattle. Covering 640 sq km, the Pata Forest Reserve is the largest forest reserve in southern Senegal. From the 1930s to the early 1970s, the integrity of the forest reserve was respected. 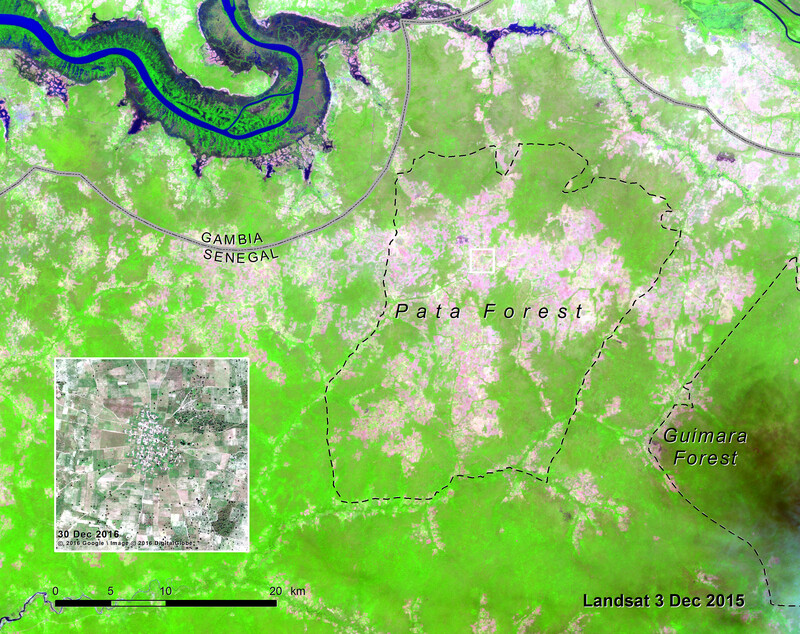 In the Landsat image from 1979, we can see that the woodland is still intact within the reserve, although a few minor incursions of cropland are visible. The situation changed dramatically in the late 1980s when Wolof farmers from the Saloum Agricultural Region Zone, seeking new land, began moving into the valleys in and around the Pata Forest. By 1999, 28 percent of the Reserve had been cleared for agriculture, fueling tensions between the local agro-pastoralists and the recent migrants (Tappan and others, 2004). 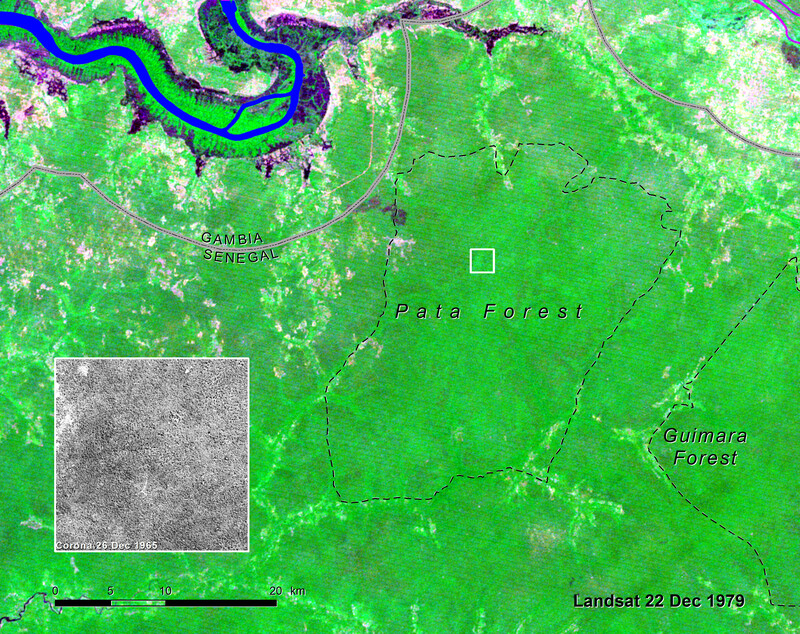 As seen in the 2015 Landsat image, the Pata Forest Reserve has almost ceased to exist as a forested landscape. Unchecked agricultural expansion surrounding numerous new settlements, together with tree harvesting for charcoal production, and selective logging for valuable timber have combined to decimate the woodland (see inset). In 2013, focus group discussions were conducted by AGRHYMET’s national team in Senegal in several villages surrounding the Pata Reserve to capture local perspectives on landscape changes. Local inhabitants cite the increase in population, increasing the demand for farmland. They also point to the significant in-migration and settlement of families from the Saloum. As secondary factors, they cite environmental change, particularly the decrease in rainfall and increasing temperature which, combined with bush fires, have accelerated degradation of the forest. They also spoke of the commercialization of valuable wood, with strong demand and flow of timber to The Gambia for export to China.